A unique collaboration between Médecins Sans Frontières/Doctors Without Borders (MSF) and Google to develop new technology for use at the height of the Ebola epidemic now offers huge promise to help improve medical care and save lives in a range of other humanitarian emergencies. As cases of Ebola reached their peak in September 2014, MSF reached out to the tech community, appealing for a way to help medical staff quickly and accurately record patients’ notes whilst in the high-risk zone of an Ebola management centre. 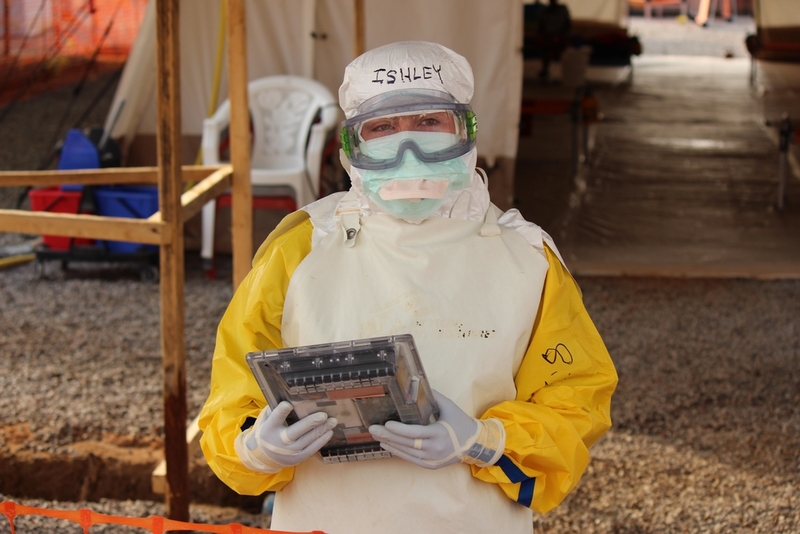 Medics working in the West African heat could spend only an hour at a time inside the personal protective suits, and usually spent the final 10 minutes of their shift shouting basic patient notes over a fence to a colleague on the other side – as even a piece of paper leaving the high-risk zone posed an infection risk. This wasted precious time that medics wanted to spend with patients, while dictating notes across a fence at the end of an exhausting shift whilst wearing a mask was a recipe for error. At the same time, the basic notes did not always give medics enough information to provide individualised care, making it more complicated to analyse a patient’s condition over time. In response to MSF’s call for help, a group of tech volunteers* formed, who were later joined by a team from Google. The team developed a waterproof tablet that can be dropped into chlorine, sterilised and safely taken out of the high-risk zone. The electronic tablet recharges quickly by being placed on a table – normal wire-based chargers have a sharp edge which could puncture gloves, posing an infection risk. The team also developed a local network server for the tablet which is the size of a postage stamp, runs on minimal energy and uses batteries that can be quickly recharged with a generator. The tablet is built to withstand humidity and storms, and is robust enough to be perfectly adapted to the challenging conditions in which MSF teams often work. Built for purpose, the software is also incredibly easy for medics to use.“We had to put on full personal protective equipment to understand how difficult it was for doctors working in the high-risk zone," says Ganesh Shankar, product manager for Google. The specially developed hardware is incredibly easy for glove-wearing, time-pressed medics to use. The tablet also allows staff to access a patient’s history and allows medics to collect more complete health data – such as pulse and respiration rates – to better track a patient’s progress and provide them with individually tailored care. 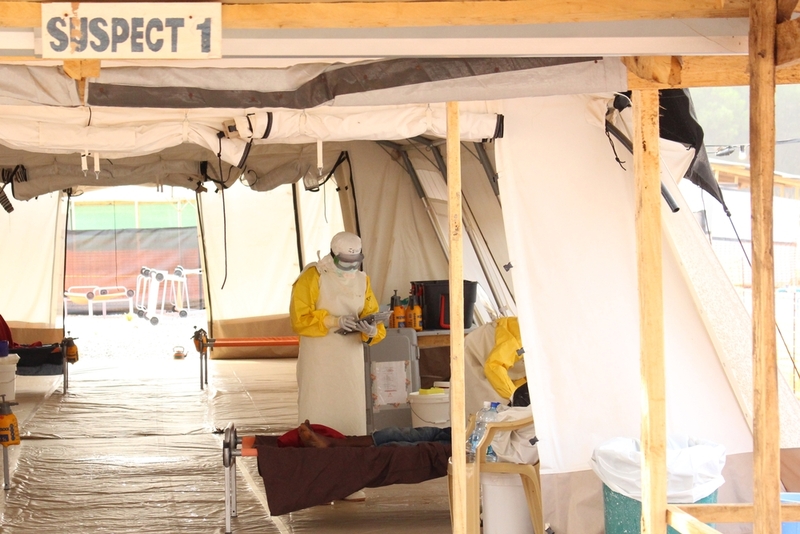 At the same time, collecting data from a large group of Ebola patients will enable medics to better understand the disease in future outbreaks. This was a laborious and potentially error-prone process when done by hand. “In the longer term, if we are able to collect more and better information about our patients, we will also learn more about the disease and how best to treat it,” says MSF’s technology advisor, Ivan Gayton, who developed the project. “Although we have just treated the largest cohort of Ebola patients in human history, we still know distressingly little about the progression of the disease. The tablets were successfully trialled in MSF’s Ebola management centres in Sierra Leone and are now in use. The technology will be open-source and MSF is now appealing to the tech community to adapt the software for use in other humanitarian emergencies, such as cholera outbreaks, nutrition crises and in refugee camps – any settings where detailed medical notes will make a difference to patient care, or where data might improve medical understanding of a disease or outbreak. “In Western hospitals, doctors take detailed medical notes that allow them to build up an individualised pictures of their patients for granted - the ability to properly track a patient’s blood pressure, for example, or their breathing when they come into an emergency room,” said Dr Jay Achar, MSF’s Ebola advisor. “I think that this kind of partnership represents the future of how NGOs are going to integrate technology into the work they do,” says Ganesh Shankar, product manager for Google.